Pullman Cairns International is a luxurious hotel located in the heart of Cairns, offering guests a little touch of luxury within a tropical setting. This Cairns Accommodation is located immediately adjacent to the shopping centre, central business district and 5 minutes walk from departure points for the Great Barrier Reef and Island Boat trips. Directly opposite the entrance is the 24hr casino and a short walk away is the Cairns Convention centre. With fabulous views of the harbour and surrounding hills, Pullman Cairns International boasts spacious hotel rooms all featuring cool, tiled floors, luxurious bathrooms finished in marble and granite and balconies that give you the feeling of additional space. Cairns is nestled between two World Heritage areas - the Wet Tropics Rainforest and the Great Barrier Reef. There is an endless array of activities and attractions for you and your family to discover on your next holiday to tropical North Queensland. 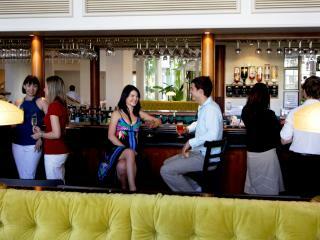 Pullman Cairns International has 321 rooms, with breathtaking city, pool, harbour or mountain views. City Mountain View Queen Room: Luxuriously appointed hotel style rooms with views over Cairns city and lush tropical mountains. Size is 40m². Bedding is 1 Queen Bed. Maximum room capacity is 3 Adults & Children. City Mountain View Twin Room: Luxuriously appointed hotel style rooms with views over Cairns city and lush tropical mountains. Size is 40m². Bedding is 2 Double Beds. Maximum room capacity is 4 Adults & Children. Harbour View Queen Room: Located on floors 9 to 13 with views of Cairns Harbour & Trinity Inlet. Luxuriously appointed marble ensuite bathrooms and superior bedding including European pillows and bolsters. Size is 40m². Bedding is 1 Queen Bed. Maximum room capacity is 3 Adults & Children. Harbour View Twin Room: Located on floors 9 to 13 with views of Cairns Harbour & Trinity Inlet. Luxuriously appointed marble ensuite bathrooms and superior bedding including European pillows and bolsters. Bedding is 2 Double Beds. Maximum room capacity is 4 Adults & Children. Premium Harbour View King Room: Located on floors 14 to 16. Exclusive room features as well as stunning views out over Cairns Harbour, Trinity Inlet & Coral Sea. Bedding is 1 King Bed. Maximum room capacity is 3 Adults & Children. Premium Harbour View Twin Room: Located on floors 14 to 16. Exclusive room features as well as stunning views out over Cairns Harbour, Trinity Inlet & Coral Sea. Bedding is 2 Double Beds. Maximum room capacity is 4 Adults & Children. Coco's Restaurant: Open daily from 6 am for breakfast, lunch and dinner served from the buffet or a la carte menu in a casual atmosphere. The famous Sunday Brunch is also served from 11.30 am on the first Sunday of the month, or spoil yourself with the nightly Just Dessert dessert buffet. The Lobby Bar: Open daily for cold drinks, tropical cocktails, an extensive wine list, light snacks and high tea served daily. Tapastry: Open daily from 11am until late, enjoy a delightful range of tapas using fresh, local ingredients. Located in The Lobby Bar. Vie Spa: Offering 10 treatment rooms including a couples suite, a vichy shower, a dedicated manicure and pedicure room for up to 6 people and a tranquil relaxation room. The Spa at The Pullman Cairns International promotes a philosophy of 'wellness and lifestyle'. There are a range of therapies available including luxurious body treatments, facials, massages and beauty treatments.